Maverick Slacklines offers the full range of services from professional slackline demonstrations and workshops to installing bespoke slackline parks for Councils, Leisure and Activity Centres with expert one-to-one tuition. The Maverick Slacklines team is the best in the UK and the riders represent UK slackline community. Maverick Slacklines has been involved with a considerable number of projects ranging from high profile demonstrations through to small scale tuition and workshops. What ever your needs, we will be able to help. Below is a portfolio of some of our work to date. Please do not hesitate to contact us if you are interested in using slacklining for your project. Maverick were contacted by the good guys at The Alternative and invited over for a team building event in Portugal. The event was hosted near the beautiful city of Lisbon at the popular beach resort, Estoril. The Portuguese weather did not fail to live up to expectations; 20C and sunny the whole time, unexpectedly warm for January! Ash and Russ flew over to run a slackline challenge we had devised called, ‘Balancing Act’. We had over 60 delegates to look after; the challenge was to see how long each person could stay on the line and points were awarded accordingly. The session was aimed at teaching people safety, technique and some introductory training before the timed challenge. It was a fun introduction to the sport and a chance for people to engage in a bit of friendly competition with colleagues. Maverick were booked by Thorpe Park to take part in Sunscream 2012.. The Maverick Slacklines crew ran demos and workshops for 10 days throughout the summer showing their skills. Thorpe Park was a great venue and the slacklines worked really well against the backdrop of the rollercoasters. We had a fun time introducing the sport to a brand new audience, many of whom decided to slackline all day rather than go on the rides, proof of just how addictive slacklining is! 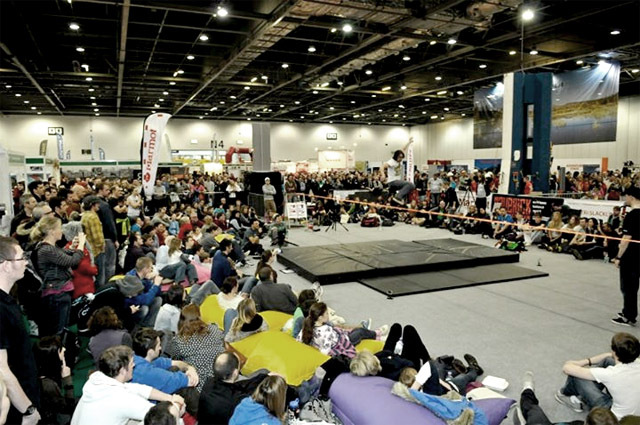 The Outdoors Show is the UK’s number one show for outdoor pursuits, held annually at London’s Excel Arena. For the last 2 years, Maverick Slacklines had been invited to add a little orange spice to the mix of the numerous pilgrims making their yearly outdoor/indoor adventure. Maverick held workshops in the ‘have-a-go’ area for people of all ages new to slacklining. We also performed slackline demonstrations throughout the event for the huge crowds. Plus the annual UK winter Slackline Jam for competitors from all over the UK with £1000 prize money up for grabs! FULL | Winter Slackline Jam 2013 from Maverick Slacklines on Vimeo. 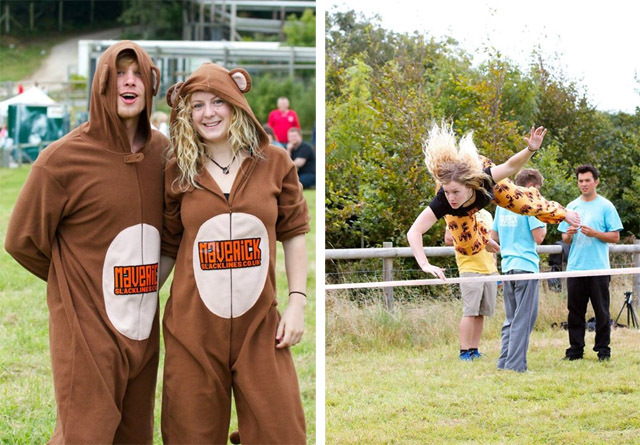 Maverick worked with the National Trust to successfully install their first slackline park at Knoll Beach in Dorset. The phased project will see another slackline park installed further up the coast at Shell Bay, one of the most beautiful stretches of beach in the UK. The project involved an innovative anchoring system to enable the slacklines to be rigged into the sand without concrete fixings. As part of the project Maverick will be running workshops and demonstrations at the facilities in the spring and summer months. 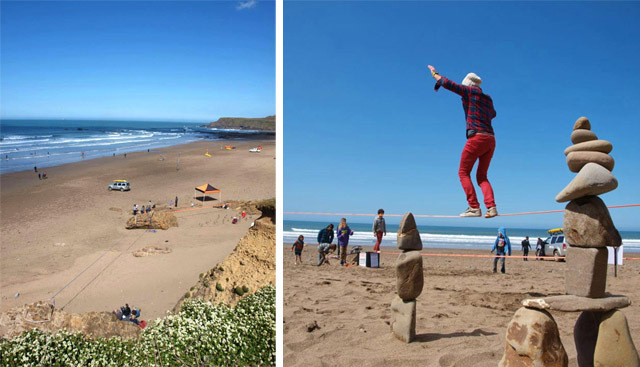 The National Trust decided that slacklining would be a great addition to what they currently offer for people down on the beach, so far the slacklines have proved to be incredibly popular. Beach Slackline Park | National Trust from Maverick Slacklines on Vimeo. Maverick worked with Monkeyworld as part of the Jim Cronin Memorial Fundraiser. 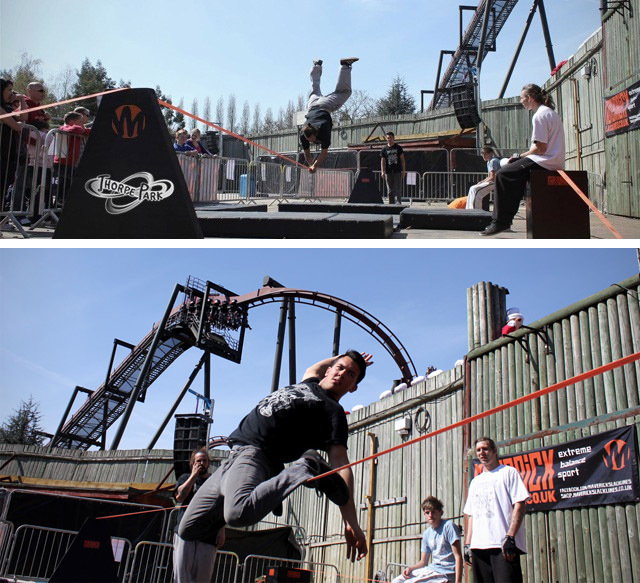 Maverick came onboard showcasing the slacklines and running workshops along side bungee-jumping and live-music. The chimpanzees at Monkeyworld have their own slacklines within the enclosure and the team felt it would be great idea to challenge visitors to test their own balance. What became clear throughout the event was the superior skills our primate cousins possess. The event was a huge success and a great time was had be all. Maverick were invited over to Exeter University to get involved with the big Children In Need event happening on campus. We were given a central space and constructed a huge outdoor slackline running along the main piazza. Despite the weather the turnout was great and we had a fun time with the Exeter Slackliners, introducing the sport to a brand new audience and doing our bit for charity. Maverick slacklines stayed over in Croyde, to take part in the annual Goldcoast Oceanfest, the music festival is the biggest and most high profile event of its kind in Devon. Maverick set up, directly back from the main stage and enjoyed a great weekend of slacklining in front of some huge crowds. We gave festival goers the opportunity to try slacklining on some learner lines and spent time explaining the sport to lots of interested people. The major part of the Olympic Torch Relay happened in Teignmouth and Maverick were invited to come down as part of the celebrations. The event involved setting up 2 lots of ground anchors and working at two different venues. We installed a large demonstration slackline on the seafront to entertain the crowds gathered for the olympic torch relay and then moved to Teignmouth Rugby Club to run further demos and workshops for the public for the afternoon/evening celebrations. we joined our friends from Aquajuice and Surfing GB at the ‘Calypso British Schools Surf Championships‘ to provide some slackline fun for the talented young surfers between heats. The venue for the champs was the beautiful Widemouth Bay in Bude, Cornwall. We were blessed with beautiful weather and good surf and the stage was set for a great day. Russ, Ian and Ryan were there to provide some demonstrations and workshops. By virtue of the picturesque Cornish coastline we were able to rig several Maverick lines using natural rigging techniques, wrapping the large boulders along the beach. Loads of the young surfers came and enjoyed the slacklining, some more successfully than others! Quite a few really got hooked and spent the whole day with us. It was inspiring to see some of the talented youngsters pick it up so quickly, confidently walking the length of the line after just an hour or two. Maverick played host to the cream of the UK trickline community as slackers assembled to do battle at the Portlebay Popcorn UK Slackline open 2013. As one of the main attractions at the Family Adventure Fun Festival in the Bournemouth International Centre, Maverick Slacklines proudly hosted the UK’s first officially licensed WSFed Slackline Open, meaning that the top 16 successful competitors would receive ‘points’ that see them placed on the international world ranking list! Portlebay UK Slackline Open 2013 from Maverick Slacklines on Vimeo.